This distinctive polypore can be found on decaying hardwood logs across the continent, helping to decompose the wood. 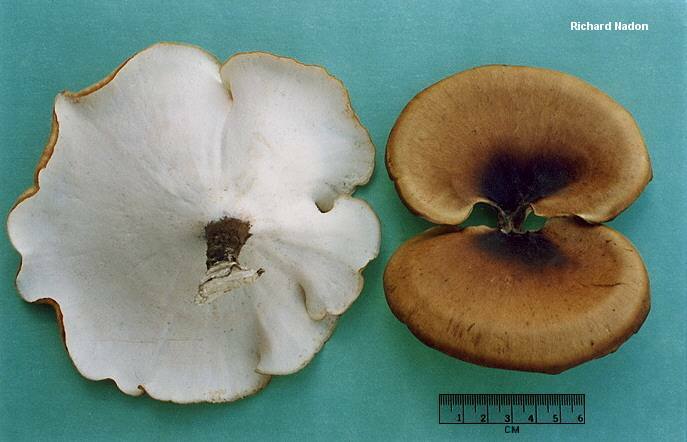 It is fond of colder temperatures, and usually appears in spring and fall in temperate regions; in warmer climates it is often a winter fungus. 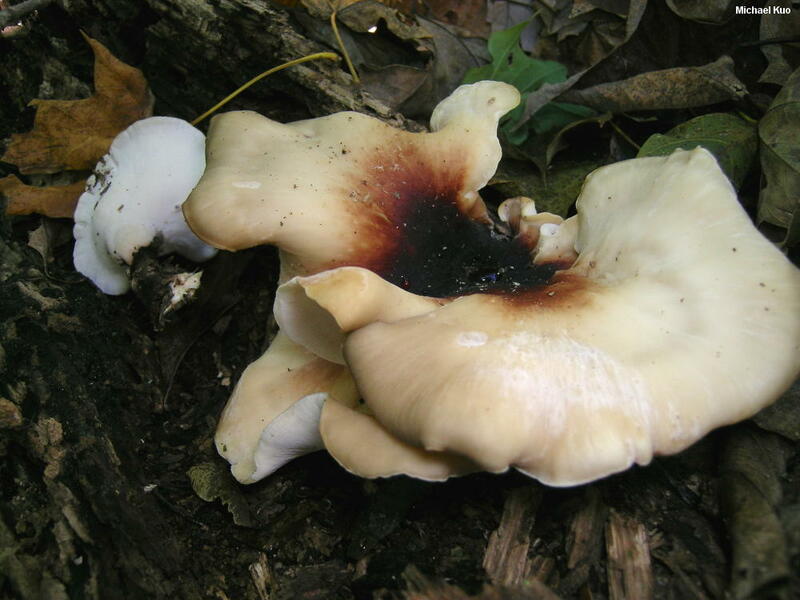 Polyporus badius features a fuzzy, black stem; a very shallow, white pore surface with extremely tiny (often invisible to the naked eye) pores; and a fairly large cap that can measure up to 20 cm across. The color of the cap is variable; it is usually reddish brown, with a darker central area—but collections are often made in which the fresh cap is creamy whitish, with a reddish brown center. The cap also blackens with age, from the center outward, resulting in quite a range of colors for the species. Polyporus varius is smaller, has a pale brown to tan or yellowish cap, and is usually found on smaller hardwood branches and sticks. 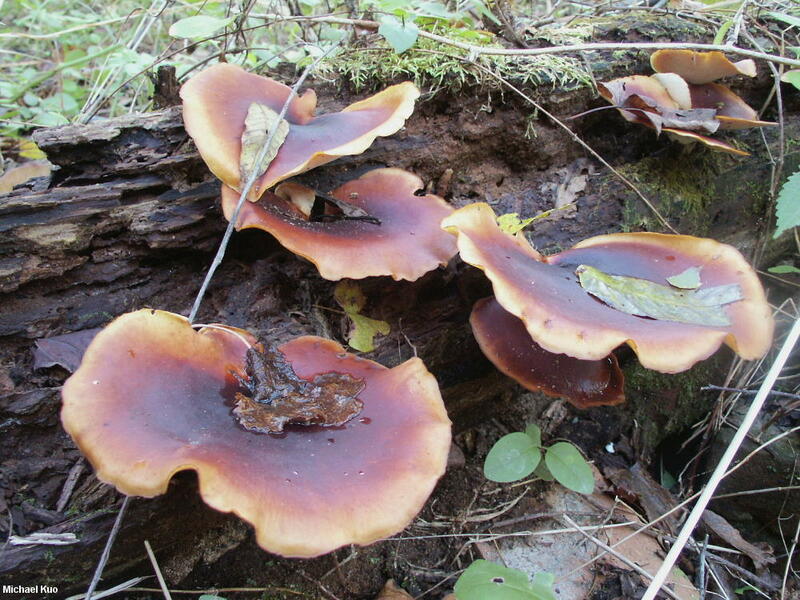 Polyporus picipes, in the sense of some authors, is a synonym. Royoporus badius is also a synonym—and this name is in fact the currently correct taxonomic label for the mushroom. But recent DNA studies (e.g., Sotome and collaborators, 2008) make it clear that the species may be placed in a different genus in the near future, so I am using the more familiar name for the time being. Ecology: Saprobic on the deadwood of hardwoods (also occasionally reported on the wood of conifers); usually appearing after the bark has begun to decay, or when it is entirely gone; causing a white rot; growing alone or gregariously; spring and fall—and over winter in warms spells or in warm climates; widely distributed in North America. The illustrated and described collections are from Illinois and Québec. 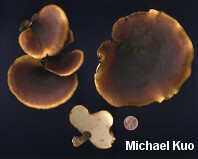 Cap: 4–20 cm; broadly convex to shallowly depressed; round, kidney-shaped, or lobed in outline; dry; bald; usually dark reddish brown to dark brown, but paler towards the margin—but sometimes pale (nearly white) overall, with a reddish brown center area; blackening slowly from the center outward with old age. Pore Surface: Running down the stem; white, becoming dingy whitish to brownish in age; not bruising where damaged; pores at first appearing "stuffed," later circular and very tiny (4–6 per mm; often invisible without a hand lens); tube layer 0.5–1 mm deep, not easily separable from cap. Stem: Central or off-center to lateral; 1–4 cm long; 0.5–2 cm wide; equal, or tapered to base; dry; pale at the apex but dark brown to black and velvety elsewhere; tough. Flesh: White; unchanging when sliced; thin; very tough. Odor and Taste: Odor not distinctive. Taste slightly mealy, or not distinctive. Spore Print: White; often very difficult to obtain. Microscopic Features: Spores 7.5–9 x 3.5–5 µm; cylindric; smooth; hyaline in KOH. Hymenial cystidia absent. Hyphal system dimitic. Clamp connections absent. REFERENCES: (Persoon, 1801) Schweinitz, 1832. (Overholts, 1953; Smith, Smith & Weber, 1981; Arora, 1986; Gilbertson & Ryvarden, 1987; Lincoff, 1992; Nunez & Ryvarden, 1995; De, 1997; Barron, 1999; Roody, 2003; McNeil, 2006; Miller & Miller, 2006; Binion et al., 2008; Sotome et al., 2008; Kuo & Methven, 2014.) Herb. Kuo 04309505, 09270302, 10290703, 05171103.